For the architectural element, see Lanai (architecture). For the city, see Lanai City, Hawaii. There is one school, Lanai High and Elementary School, serving the entire island from kindergarten through 12th grade. There is also one hospital, Lanai Community Hospital, with 24 beds, and a community health center providing primary care, dental, behavioral health and selected specialty services in Lānaʻi City. There are no traffic lights on the island. 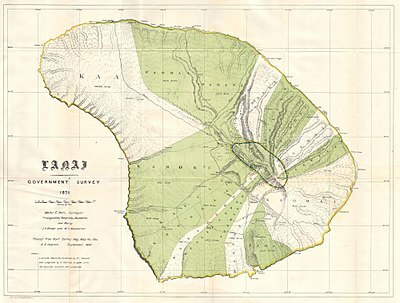 Lānaʻi was under the control of nearby Maui before recorded history. Its first inhabitants may have arrived as late as the 15th century. The name Lānaʻi is of uncertain origin, but the island has historically been called Lānaʻi o Kauluāʻau, which can be rendered in English as "day of the conquest of Kauluāʻau." This epithet refers to the legend of a Mauian prince who was banished to Lānaʻi for some of his wild pranks at his father's court in Lāhainā. The island was reportedly haunted by Akua-ino, ghosts and goblins. Kauluāʻau chased them away and brought peace and order to the island and regained his father's favor as a consequence. The history of sugar-growing in Hawaiʻi goes back to 1802, when a farmer from China, Wong Tse Chun, produced a small amount on Lānaʻi. He used a crude stone mill that he had brought with him to crush the cane. In 1921, Charles Gay planted the first pineapple on Lānaʻi. The population had again decreased to 150, most of whom were the descendants of the traditional families of the island. A year later, James Dole, the president of Hawaiian Pineapple Company (later renamed Dole Food Company), bought the island and developed a large portion of it into the world's largest pineapple plantation. 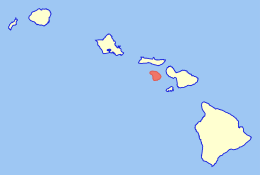 With Hawaii statehood in 1959, Lānaʻi became part of the County of Maui. In 1985, Lānaʻi passed into the control of David H. Murdock, as a result of his purchase of Castle & Cooke, then owner of Dole. Kamoku hosts the largest share of population, because the bigger part of Lānaʻi City falls into it. Parts of Lānaʻi City stretch to Kaa and Paomai. As of 2010 [update], the remaining ahupuaʻa were virtually uninhabited. According to the census of 2000, Lānaʻi City accounts for 99 percent of the island population (3164 of 3193). As a census-designated place, Lānaʻi City is defined solely for statistical purposes, and not by administrative boundaries. As of 2016 [update], the two resort hotels on Lānaʻi were managed by Four Seasons Hotels; the Four Seasons Resort Lanai in Manele Bay at Hulupoe Beach, just a few steps from where the ferry from Lāhainā docks, and the Lodge at Kōʻele in the mountains. The Hotel Lānaʻi in Lānaʻi City was built in 1923 by James Dole of the Hawaiian Pineapple Company as a lodge to house the executives overseeing the island’s pineapple production. It was the island’s only hotel until 1990. Lānaʻi is also home to three golf courses, one at each Four Seasons resort and a third, free course. The Challenge at Manele borders the ocean and was designed by Jack Nicklaus. Bill Gates was married on the 12th hole tee-box at The Challenge at Manele. The Experience at Koele is located in the mountains of Lānaʻi and was designed by noted Southern California golf course architect Ted Robinson Sr, with input from Greg Norman. In Lānaʻi City, there are no traffic lights, no shopping malls, and public transportation is supplied by the hotels. For a one-time fee, hotel guests enjoy unlimited rides on small and large buses that go between the hotels and the ferry landing on Manele Bay. Bicycles and off-road vehicles are for rent at the local Gas Station and Dollar Rent a Car. Most attractions outside of the hotels and town can be visited only via dirt roads that require an off-road vehicle. Danny Lockin, actor, dancer, born in Lānaʻi in 1943. Best known for his role as Barnaby Tucker in the 1969 movie Hello Dolly!, he played the same role in the Broadway play and when it went on tour across The United States. ^ "Oracle's Ellison to buy, invest in Hawaii's Lanai - latimes.com". Archived from the original on June 24, 2012. ^ a b c Mooallem, Jon (September 23, 2014). "Larry Ellison Bought an Island in Hawaii. Now What?". The New York Times Magazine. Retrieved 1 December 2017 – via www.nytimes.com. At a public meeting on Lanai last year, an Ellison representative explained that his boss wasn’t drawn to the island by the potential for profits but by the potential for a great accomplishment — the satisfaction one day of having made the place work. For Ellison, it seemed, Lanai was less like an investment than like a classic car, up on blocks in the middle of the Pacific, that he had become obsessed with restoring. He wants to transform it into a premier tourist destination and what he has called “the first economically viable, 100 percent green community”: an innovative, self-sufficient dreamscape of renewable energy, electric cars and sustainable agriculture. ^ NAGOURNEY, ADAM (August 22, 2012). "On Lanai, Tiny Hawaiian Island, a New Owner". The New York Times. Retrieved 1 December 2017 – via www.nytimes.com. ^ "Table 5.08 - Land Area of Islands: 2000" (PDF). State of Hawaii. 2004. Retrieved 2007-07-23. ^ "American FactFinder - Community Facts". Factfinder2.census.gov. 2010-10-05. Archived from the original on 2014-12-10. Retrieved 2013-06-17. ^ "Lanai city" (PDF). State of Hawaii. Retrieved November 17, 2011. ^ Lanai Community Hospital Retrieved 30 June 2017. ^ Lanai Community Health Center Retrieved 30 June 2017. ^ "Heritage Sites of Lanai". Retrieved 18 September 2014. ^ a b Time line of key events in LĀNA‘I's history Lana'i Culture and Heritage Center. Retrieved 7 July 2017. ^ "Maunalei, Keomoku and the Kahalepalaoa Vicinity". Lānaʻi Culture & Heritage Center. Archived from the original on 2011-06-05. Retrieved 2010-12-10. ^ Kaye, Robin (1982). Lanai Folks. Honolulu: University of Hawaii Press. pp. 16–17. ISBN 978-0-8248-0623-1. ^ Time line of key events in Lanai's history Lana'i Culture and Heritage Center. Retrieved 7 July 2017. ^ Bort, Julie. "Billionaire Larry Ellison Has A Brilliant Plan To Make Green Energy Affordable With His Hawaiian Island". Business Insider. Business Insider. Retrieved 28 December 2018. ^ "Lānaʻi to become eco-lab that runs on solar, billionaire Ellison promises". NBC News. October 5, 2012. Retrieved October 5, 2012. ^ Cooper, Jeanne (February 8, 2013). "Lanai says aloha to good times again". San Francisco Chronicle. Retrieved February 9, 2013. ^ Runnette, Charles (April 13, 2016). "Larry Ellison's Private Eden Is Open for Business". Bloomberg News. Retrieved 1 December 2017 – via www.bloomberg.com. ^ a b Brodwin, Erin. "Billionaire Larry Ellison is teaming up with Steve Jobs' former doctor to launch a mysterious wellness company on his private island". Business Insider. Business Insider. Retrieved 28 December 2018. ^ "2004 State of Hawaii Databook: Table 5.11 - Elevations of Major Summits" (PDF). State of Hawaii. 2004. Retrieved 2007-07-23. ^ "Paoma Ahupua'a neighborhood in Lanai City, Hawaii (HI), 96763 subdivision profile - real estate, apartments, condos, homes, community, population, jobs, income, streets". City-data.com. Retrieved 2013-06-17. ^ Moore, James G.; Moore, George W. (14 December 1984). "Deposit from a Giant Wave on the Island of Lānaʻi, Hawaii". Science. 226 (4680): 1312–1315. doi: 10.1126/science.226.4680.1312. PMID 17832630 – via www.sciencemag.org. ^ Annual Report 2016 Hawaii Tourist Authority (PDF). Retrieved 7 July 2017. ^ "Cavendish Golf Course". Go Hawaii. Hawaii Tourism Authority. ^ Vincent, Roger (June 22, 2012). "Oracle founder Larry Ellison buying Hawaiian island of Lanai". Los Angeles Times. Retrieved July 10, 2012. Wikimedia Commons has media related to Lanai. 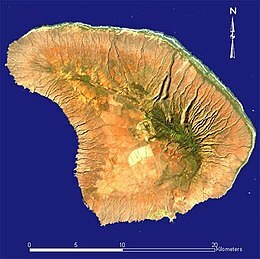 Wikivoyage has a travel guide for Lanai. "Chapter 6: Lānaʻi" (PDF). Hawaii’s Comprehensive Wildlife Conservation Strategy. State of Hawaiʻi. 2005-10-01. Archived from the original (PDF) on 2011-06-16. Retrieved 2009-02-28. Guthrie, Julian (2013-06-13). "Larry Ellison's Fantasy Island". Wall Street Journal. Retrieved 2013-06-17.